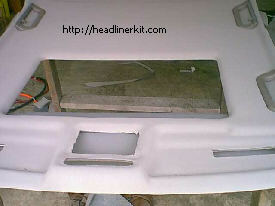 How to replace a BMW headliner; with step by step pictures. 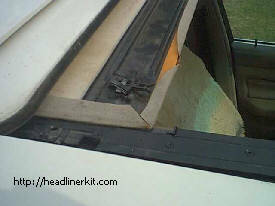 This is a 91 BMW 525i with a sunroof that was in need of a new headliner. 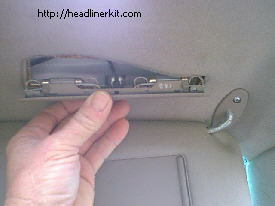 The headliner is replaced basically the same way as any other car; but slightly more complicated because of the sunroof and recessed handles, and a few other goodies, like the headliner board being removed through the rear passenger door. But with a little persistence and hard work, nothing is impossible. 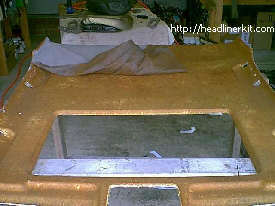 The color used here is 1771 tan, if you have a gray headliner, 2165 gray will match it. 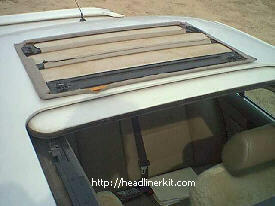 A BMW, Jaguar, Saab, Audi, Volvo headliner kit will do this car; click this link to go to the order page. Baggy Headliner in a good looking auto. 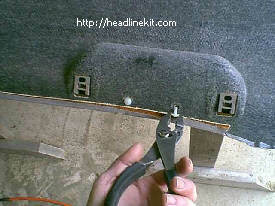 Remove all the things that attach through the headliner board; such as the visor lights (they snap out). Remove the handles above each door. There is a little cover over the screws that snaps out. Remove the screw but leave the handle attached to the board. You can remove them later. Unsnap the front post covers and the rear side panel covers. 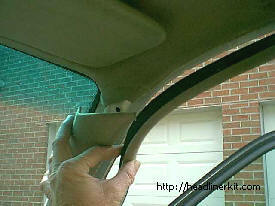 Pull the pinch welt trim loose that trims the edge of the headliner board over the door openings. 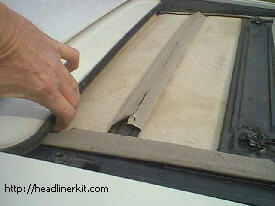 The board is ready to drop down; there are clips holding it around the sunroof opening and at the rear. Open the sunroof about 2/3 way back. Push the covered piece back; allowing the clips that hold it in place to be detached. The 2 black clips you see at the front of the cover here. Then pull the cover out slowly. There are 2 studs attached to the sunroof that the clips were attached to. 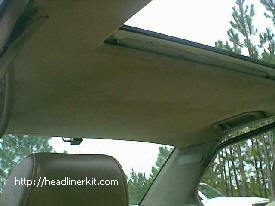 You may have to pull up on the metal of the sunroof for the cover to slide out. 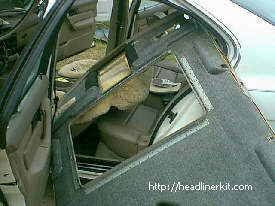 Remove the headliner board through the back drivers side door. You can see the metal slats around the opening; this is where the clips are attached that secures the board around the sunroof opening. 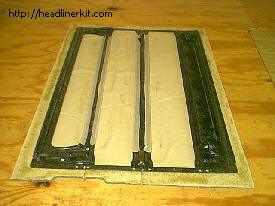 Remove the old material and clean the board with a brush to remove the old deterioated foam. When the board is clean; glue the new material to the board. Take care around any recessed areas that the material is worked into the recess as it should be. Rub it out with the palm of your hand to ensure a good adhesion. 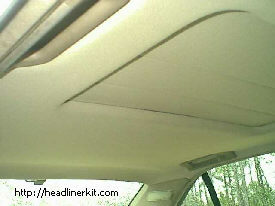 Trim the material around the sunroof opening to about 1 1/2 inches and spray with glue...then fold over and stick it! Cut all the holes for the goodies that you took down and you are good to go. Take the old material off the sunroof cover and glue another piece to it...folding it over and gluing it to the backside to trim it off. 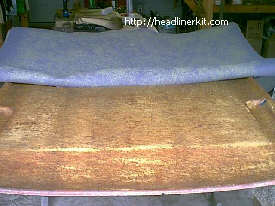 Slide the headliner board back in the automobile and replace everything; and then slide the sunroof inside cover back into place....NEW HEADLINER. 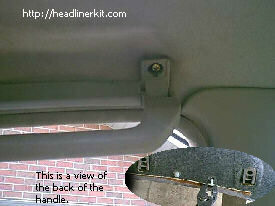 This is just another view of the backside of the handles above the doors.